I have purposefully broken with tradition in describing the Routemaster without any prefix (except "The") and you will see that it has a place of its own on this site, not being in a subheading of LT, AEC or PRV, or indeed Eastern Coachworks or Metro Cammell Weymann. One of the most common misnomers in my opinion is to call the bus an AEC Routemaster which it was not - and I shall explain. Though, given that LT had a long established agreement to source three quarters of its vehicle requirements from AEC, it was for certain that AEC would become the de facto primary interface to the suppliers for the Routemaster project, and for this reason alone, it is perhaps understandable therefore that this misrepresentation exists. In the late 1940's London Transport had a vision for a new bus to replace trolleybuses and its ageing RT fleet too, and to have sufficient longevity and efficiency to make it both practical and cost-effective to build. LT had heretofore designed its own buses using external manufacturers to build the vehicles and had built up a strong relationship with AEC (Associated Equipment Company). And by 1949 AEC was part of the ACV Group (Associated Commercial Vehicles) that had the combined strength of two of the most renowned companies in the PSV business, AEC and its sister company PRV (Park Royal Vehicles). 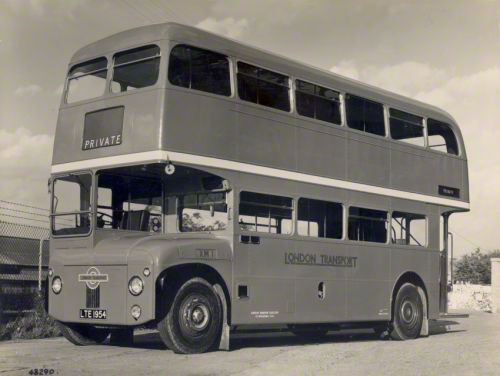 For economy, durability and longevity (& other associated nouns) it was evident that off-the-shelf bus designs were preferable and this was a path that LT was to follow with its fleet beyond the Routemaster, but it was thought that a radically new design of rear-platform bus could be built in sufficient numbers to offset the initial cost-effectiveness of an off-the-shelf product. 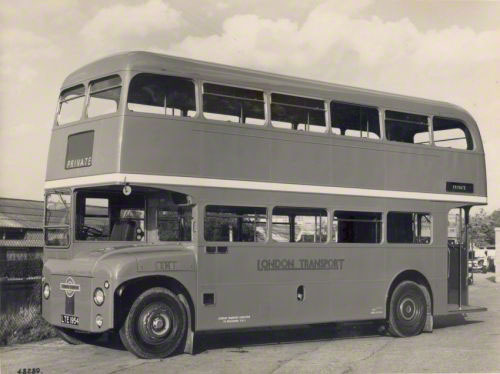 The Routemaster was thus the brainchild of LT and was the last bus to be conceived and initially designed by LT.
LT's concept was for a bus of an integrated design having no chassis in the traditional sense but instead a light but strong rigid body that would carry front & rear running units that provided the traction, in essence a monocoque. For both lightness & strength the body would need to be in aluminium and the running units, bulkheads/body sections needed to be interchangeable to limit repair/maintenance time. The whole also requiring a high degree of parts standardisation to reduce costs. And the vehicle needed to be straightforward to drive to ease the transition of its "army" of trolleybus drivers and thus limit retraining costs. LT, in a futile effort to continue its outsourcing to multiple companies, commissioned four prototypes. The first two (RM1 & 2) were built at LT's Chiswick Works by the combined forces of LT, AEC & PRV (where my father was responsible for the detailed design of the bodywork), and the others, to have Leyland engines, RML3 ("L" standing for Leyland & later renamed RM3) by Metro Cammell Weymann at Addlestone, and CRL4 ("L" again standing for Leyland & "C" for Coach & later renamed RMC4) to be built by Eastern Coachworks in Lowestoft. There were also three test rigs that didn't look much like buses. After several years of design & development, RM1 was unveiled at the Commercial Motor Show in 1954. Unsurprisingly, the first order for Routemasters was placed with Park Royal in 1956, all to have AEC running units. And, apart from the two non-ACV prototypes, that in 1956 had yet to be completed, all Routemasters were to be built by PRV; though, from the 1960's, many were ordered with Leyland engines considerably reducing the AEC content. London Transport had opposing policies, one a purchasing agreement with AEC, and the other, a desire to pursue competitive tender; hence the MCW & ECW prototypes. But, no doubt, MCW & ECW were disadvantaged. They built their prototypes at their own factories, they used Leyland running units and neither were proximate to LT at Chiswick. It seems obvious that they were never likely to be serious challengers to the AEC/PRV team and win a slice of the contract; which they didn't. However, Leyland later proposed supplying complete running units than just the engine; an idea that was favoured by LT.
AEC fiercely resisted Leyland's proposals (a stance that was to be the catalyst for much later animosity between ACV/AEC & Leyland), by demanding that LT adhere to its long established contractual purchasing agreements. Conversely LT, whilst determined to spread its outsourcing, could not agree to Leyland's request for sufficient orders to create the economy of scale necessary for competitive pricing. Again, working against LT's desire for competitive tender, the later amalgamation of ACV with the Leyland group was met with much dismay by LT's management who realised that it was effectively back to dealing with a single source supplier. Since the early 1960's LT had been servicing its fleet of Routemasters at its Aldenham Works regularly swapping bodies, somewhat making a mockery of those intent on placing crosses against spotted buses, and with the demise of AEC in 1979, and especially Leyland itself in 1986, LT was forced to have worn out engines replaced with those from other manufacturers. Some were fitted with DAF engines but Fiat Iveco engines became a popular choice. And when the Aldenham Works was closed, also in 1986, the servicing of the slowly diminishing fleet was outsourced. The servicing became irregular and was restricted as, although adequate, the outsource suppliers could not provide the same quality of service as at Aldenham. This resulted in many Routemasters becoming a little less reliable and losing visual quality. There were many derivatives of the Routemaster, many which were to remain on the drawing board, but one significant (the FRM), and over fifty more subtle, varieties made it into production and service. All were designed and built at Park Royal. This site is not intended to be a thorough explanation of the Routemaster, there are other sites (and many books) that most eruditely cover the subject, but due to the variety of interest in the Routemaster from its technical through its iconic attributes you will hopefully find something of interest in these pages. See also the RM Links page.